Portfolio management is much more than making a bunch of decisions about investments — it is an art. To be more in depth, portfolio management is the art of making the correct, risk-adjusted, investment decisions that fit an investor or advisors specific time horizon. Just like with any art, in order to achieve the best results, portfolio management takes time, patience, and experience. For financial investors, the optimal portfolio for one investor can differ from others. However, for most, investors look to achieve a well-constructed portfolio with optimal risk-adjustment. 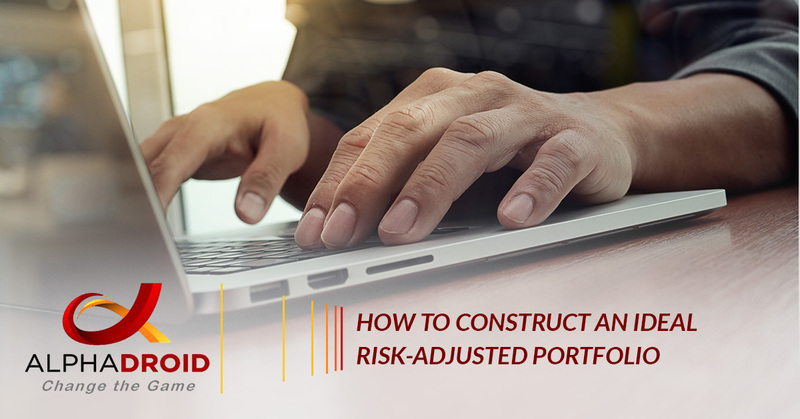 In this article, we are going to reveal some of the core concepts of constructing an ideal risk-adjusted portfolio. Before beginning to build a portfolio, financial investors should consider two constants that are unique and will significantly determine how the portfolio is built. Established constants will serve as restrictions, which will guide how the portfolio is balanced, which assets are included, and the duration for which the assets should be held. Let’s take a look at the two constants. Investing is solely about the level of return per unit of risk. Generally, most investors understand that if an owned asset produces a higher return, it typically will come with a greater risk. With this in mind, investors should first define the risk and return for a specific time period before setting out to construct portfolios. In the investing world, this is known as ‘risk tolerance’ and it is the initial ground from which investors should begin constructing their portfolio. When calculating risk tolerance, investors must first define the amount of money that they can afford to lose. Then, by dividing the dollar value of assets that they can afford to lose by the initial investment amount they will be provided with a percentage that is a rough estimation of their risk tolerance. Example: If an investor decides that they can afford to lose $2,000 from a portfolio that is valued at $28,000, their personal risk tolerance would be around seven percent. The second constant that investors need to determine if the time horizon for their investment. Each investor must determine when they will need access to their investment funds again to figure out how long they can hold their portfolio’s assets. A good way to determine this is by reflecting upon the purpose of a client’s or their personal investment. This should help with the decision of which investments should be avoided and how long each particular asset should be held before selling. It is important for investors to consider portfolio volatility, which could potentially deter investing in the short term; however, the same portfolio volatility may be more acceptable for a longer investment time horizon. Once the constants above are defined, investors can start building their investment portfolio. Diversification. “Never put all your eggs into one basket” is one saying that is often tossed around freely in the investment world. Not even the best investors can predict the future market conjuncture with 100 percent certainty. There are, and always will be, unforeseen events that can dramatically affect the market as well as the assets that are invested. To reduce this risk, it is better for investors to choose several assets to invest in, as the probability of all of them depreciating at the same time is much lower than the probability of a single asset doing the exact same thing. To learn more about diversification, check out one of our recent blogs. Limit the Number Of Assets. While portfolio diversification is a good thing, diversifying too much is not. The number of assets which are held in an investors portfolio must not exceed what they can monitor easily. In order to have success, investors should keep a close eye on their portfolio(s), and adapt to any major changes in the market. Holding a large number of assets can cause confusion, which could potentially lead to portfolio depreciation. Be Practical. Investors should commit at least one day per fiscal quarter to analyze a portfolio’s performance and composition. Investors should know what is going on with each of their assets, and why. Knowing this information helps investors make more informed decisions to maintain the health of their portfolio. Don’t Trade Too Frequently. It is essential for investors to find an asset allocation that works for them. This asset allocation should only be adjusted in case of major life events, which can alter their risk tolerance and their time horizon. Trying to time the market will result in quick loss of money, as investment fees and wrong entering and exit points will dwindle their capital. Don’t Be Emotional. Markets are continuously fluctuating around long-term trends, so there are often times when the economy as a whole will act unreasonably. Actions such a panicking during market downturns and buying frenzies during upturns can lead investors to buying high and selling low, ultimately taking an unpreferred loss. In order for investors to be successful, they must follow their initial investment strategy and resist the temptation to purchase and sell based on emotion. By following the advice above, investors can construct and maintain a strong and stable portfolio that is personalized to their risk and return needs. A traditional three-fund portfolio strategy is based on two fundamental asset classes, stocks, and bonds, and suggests that investors should hold both domestic and international stocks instead of selling. Thus, investors must choose what percentage of their portfolio they wish to invest in domestic and international stocks, as well as bonds. Bonds are typically considered to be a more stable but less profitable asset class. For investors that are experienced and confident and don’t mind a little risk, it is recommended to add individual stocks to the portfolio; however, no more than 20 percent should be invested in it. By following the tips and advice above, investors should be able to construct a risk-adjusted investment portfolio with an asset allocation that works based on their risk and return needs. Tracking and managing an investment portfolio can be time-consuming and is often not easily done. However, with AlphaDroid, a premium financial portfolio management software, investors are better equipped to easily manage and track investments in their portfolio. AlphaDroid uses various algorithmic trading strategies to help predict the market by following trends, helping advisor reduce risk and promote higher returns. With AlphaDroid’s asset allocation software, investors are equipped with a systematic and disciplined approach to proactively catch the best days in the market while ignoring the worst. Investors looking for an easier way to track and manage — as well as a better way to analyze, construct, and compare — investment portfolios can do so with investment technology from AlphaDroid. If you are interested in trying one of the elite investment portfolio management software, try a free trial of AlphaDroid today!